It’s been a month since we set our monkeys free, and we want to thank you all for such a warm welcome. Thousands of players around the world have played with our monkeys and their everyday life (some of them even dared to feed them, can you imagine?). Plus, the game has been featured in lots of media with great reviews; dozens and dozens of gameplay videos are on-line on YouTube and Twitch; almost 900 reviews have been submitted to Steam so far, 91% of them being positive. It all means most players are loving Do Not Feed the Monkeys… and we can’t be happier about it. On behalf of the Fictiorama, Badland and Alawar Premium teams… thanks SO MUCH! To top it all off, a few weeks ago we showcased Do Not Feed the Monkeys at PLAY18, a festival that takes place every year in Hamburg (Germany). We had a wonderful time at the event, firstly because of the love the festival’s staff shows for games, developers and visitors. Every game in the exhibition featured a customized booth… and, to be honest, we never saw a setup for Do Not Feed the Monkeys as cool as the one they made for the game! The game was a finalist in the Most Creative Game category, along with the fun The Book Ritual by Alistair Aitcheson (that features a real, working paper shredder! ), and the beautifully touching My Child Lebensborn by Teknopilot & Sarepta Studio. 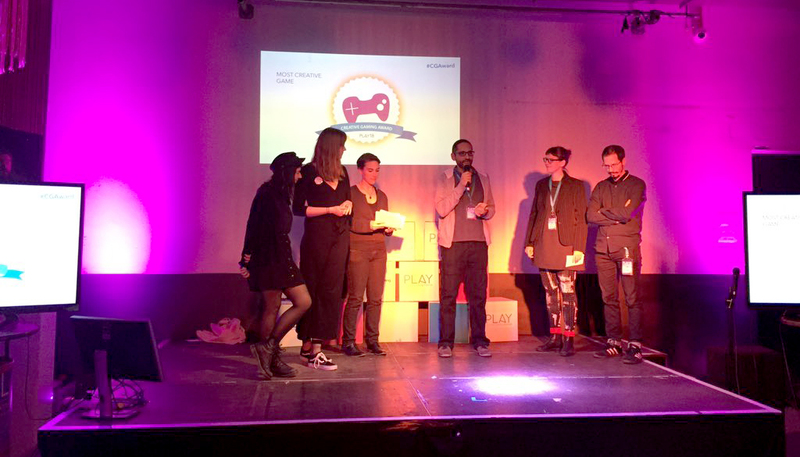 After a really fun ceremony hosted by Alistair Aitcheson himself, that included some crazy Sonic competitions… it happened that the jury decided to award Do Not Feed the Monkeys the Most Creative Game prize! The Most Innovative Newcomer as well as the Audience prizes were awarded to Symbio, a cooperative platformer that makes players hold hands to overcome obstacles. Besides, we had the chance to play games as cool as Riot, Baba is You, It’s Paper Guy!, Segelbootepusten, Not Tonight, Fuir la Guerre, GetBadNews, Oddly Assorted, Vandals and so many more. Some of them have not been released yet, so it was great to have the chance to give them a try! Mind the EU flag missing a star on the right? That was the setup for Not Tonight. Brilliant! 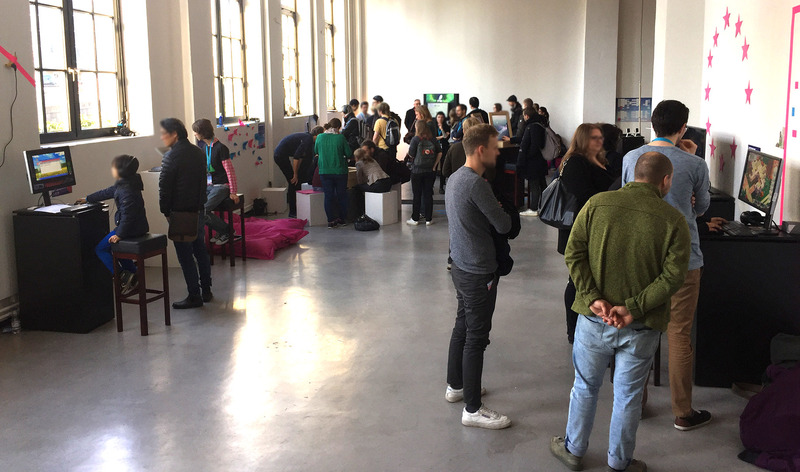 Thanks a lot to the staff, jury, developers and visitors that participated in PLAY18. We had an awesome time! And, well, if you love video games… do not miss PLAY19 next year!